Super cool 80's funk and soul oozes from this high end pack of MIDI Construction Kits. Slick keyboard hooks, awesome synth bass lines and classic chord progressions bursting with authenticity. Played by a top session keyboard player to achieve the maximum level of performance. 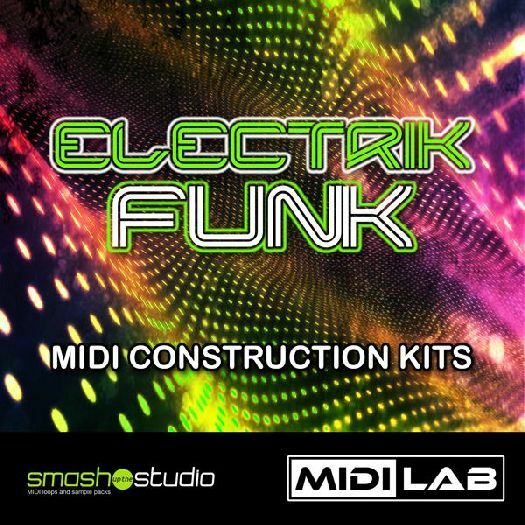 Smash Up The Studio continue their MIDI Lab range of Construction Kits with " MIDI Lab: Electrik Funk " a journey back in time to when the best musicians of the day turned their hands to electronic keyboards to create a brand new sound. Gone were the horns, strings and piano and in their place came classic synths like the Mini Moog, Jupiter 8, and a host of others. This pack focuses on the funk and soul styles of the mid 80's where analogue synths were still hugely popular but also new digital keyboards such as the Yamaha DX7 started becoming very widely used.
" Electrik Funk " consists of 3 MIDI Construction Kits featuring all the MIDI loops used in our 3 demo tracks. Each track is divided into separate loops ready for you to arrange and mix. The kits are key and tempo labelled and include an mp3 mix for reference. 3 MIDI Construction Kits. 111 loops in total. Please note: Smash Up The Studio MIDI packs contain MIDI keyboard and instrument loops only. They do not contain audio or drum loops.